Afternoon snack was a GIANT honeycrisp apple. It was fantastic – crisp and juicy! Sadly, the picture seems to have gotten eaten by my phone and/ or my computer. I’ve decided I really don’t like the fact that Wednesday night yoga is at 7:15. I much prefer the 7:45 class on Mondays. I’ve been going nonstop since I got off the bus. My mom is coming to pick me up for yoga (Chris still had my car.) at 6:50, and the dinner I was planning tonight takes about 40 minutes. That leaves me about 10 minutes to eat said dinner. To some extent this was poor planning on my part. I need to plan faster meals on Wednesdays when I have less time to cook before class. I was going to switch plans up, but I forgot a couple items when I went shopping yesterday (even though they were on my list, ugh!) so swapping one of the less time consuming meals on the agenda this week wasn’t even an option. So what was tonight’s dinner. 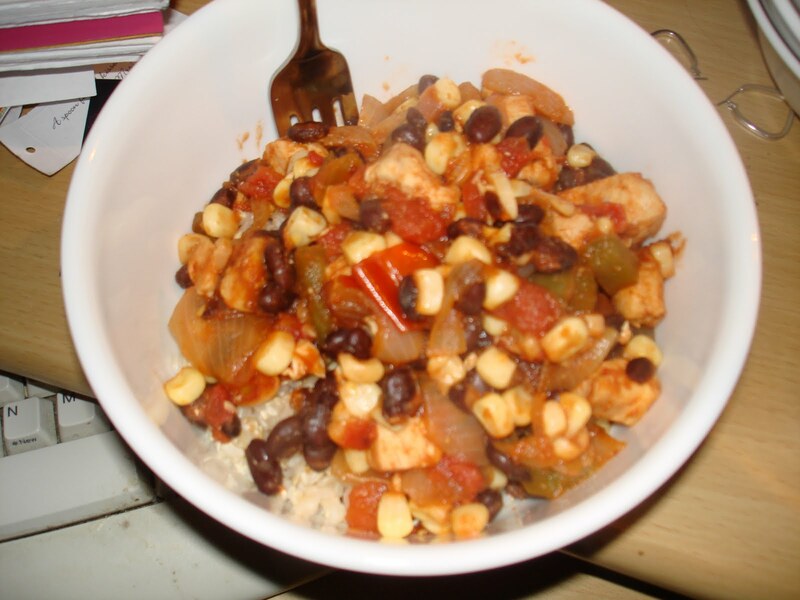 You might remember from my meal plans that tonight I’m made Southwest Chicken Stew. Honestly, the prep time wasn’t bad, but the recipe calls for it to simmer 20 – 30 minutes. I think this might be one that would work out well in a slow cooker too. I subbed chilli powder for the cumin since I didn’t have cumin and didn’t want to buy it for just this recipe. I also used a can of diced tomatoes. I think next time I might add a small can of tomato sauce to give it a little more liquid. I also only simmered it about 15 minutes. You can’t see it in the pictures, but I ate it on top of/ with 3/4 c. of brown rice. This is definitely a make again, but I can see myself changing it up a little bit next time. Previous Post077. February Goals + More Kashi GoodnessNext Post079. What Is Going On Here?